Yesterday was a day of firsts. I invented my first-ever recipe for granola, participated in my first video shoot, edited my first video, joined YouTube and uploaded my first video to the internet. And today I bring you my first Vlog. This is all a bit intimidating for me because really I’m a big introvert and I don’t even like having my picture taken. The occasion was so I could participate in Bob’s Red Mill’s Spar for the Spurtle competition. I found out about the contest after I met Bob’s Red Mill representatives at the BlogHer Food Conference last month. I may be an introvert, but I am also a competitive person by nature, and I love the challenge of trying something new. 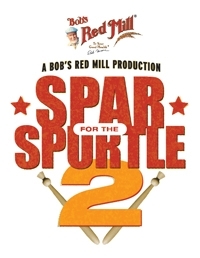 The premise behind the Spar for the Spurtle competition is that contestants must develop a unique recipe featuring Bob’s Red Mill Steel Cut Oats and showcase the recipe in a video no longer than 3 minutes. With my husband’s videography skills, we put together the video using the movie setting on my DSLR camera. I’m actually quite pleased with how well the recipe turned out, because it originated from an idea that just popped into my head. This granola combines ingredients such as vanilla extract, organic coconut palm sugar, spiced rum, shredded coconut, cashews and almonds, dried mango and pineapple and candied ginger. 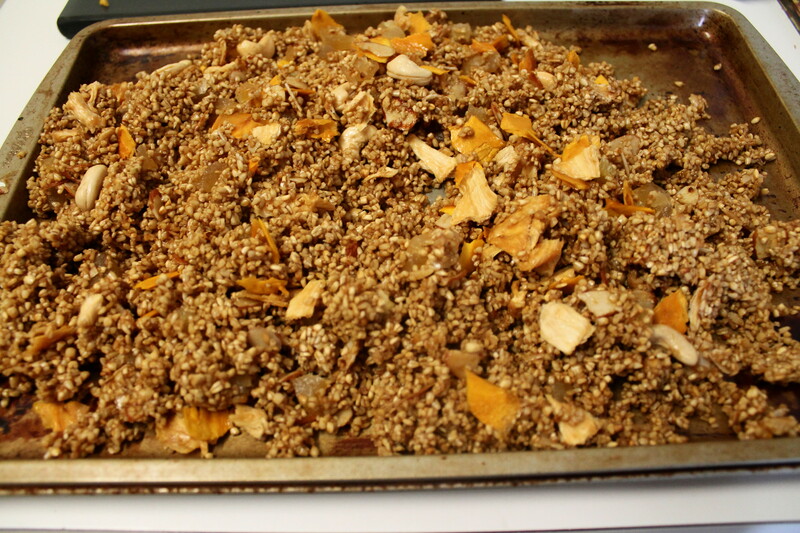 It’s versatile enough to be eaten as a breakfast cereal, yogurt topping or trail mix. My husband and I have been snacking on it ever since it came off the stovetop. And if you’d like to enter the Spar for the Spurtle competition yourself, the deadline is this Friday, July 20th. Get all the details on the competition here, and if you submit a video, please be sure to also comment on this blog post with link to your video to receive a free prize pack featuring Bob’s Red Mill products. You can watch the other video entries to the competition at the Spar for the Spurtle website and “Like” your favorites. Thus far my personal favorite is the oatmeal pancakes with apple flambe. Maybe because it involves whiskey? Click here to watch my video and get all of the recipe goodness. This entry was posted in DIY, Recipes and tagged Bob's Red Mill, breakfast, contests, granola, recipes, snacks, Spar for the Spurtle, vegetarian recipes. Bookmark the permalink.